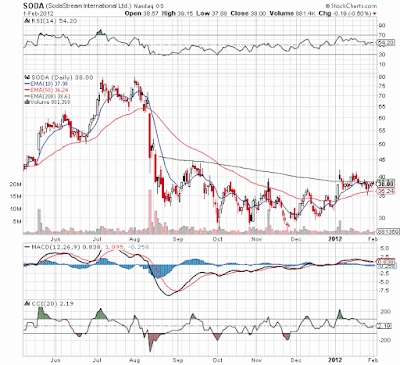 Based on the chart and earnings of associated stock Green Mountain Coffee (GMCR), it sure appears that SodaStream (SODA) is about to explode higher. SodaStream's stock was crushed mid-year dropping from a high around $80 to a low around $30. Why? All due to very conservative guidance from a management team that continues to UPOD almost similar to the Apple (AAPL) history. SodaStream has beaten estimates by nearly 60-80% a quarter since going public and naturally gave very conservative guidance for Q4. Why then did analysts completely take the number given by management? Amazingly analysts have actually guided towards a drop in earnings from $.25 to $.21 in Q411. That also equates to a 50% drop from Q311. How is that possible when Q4 is such a huge quarter in the US? It is very puzzling to us as well. As with Apple for years, analysts have quickly forgotten how management lead them towards the $.27 estimate in Q3, even though the company produced $.42. This brings us to Green Mountain Coffee which in a way is the coffee version of SodaStream. Both companies have had dramatic growth heading into 2012, while both stocks were crushed. Analysts have taken apart the financials with a fine tooth comb. Ultimately though Green Mountain just reported a massive earnings beat after the market close leading to a 20% gain. To us, this is more validation of the negativity in the sector. 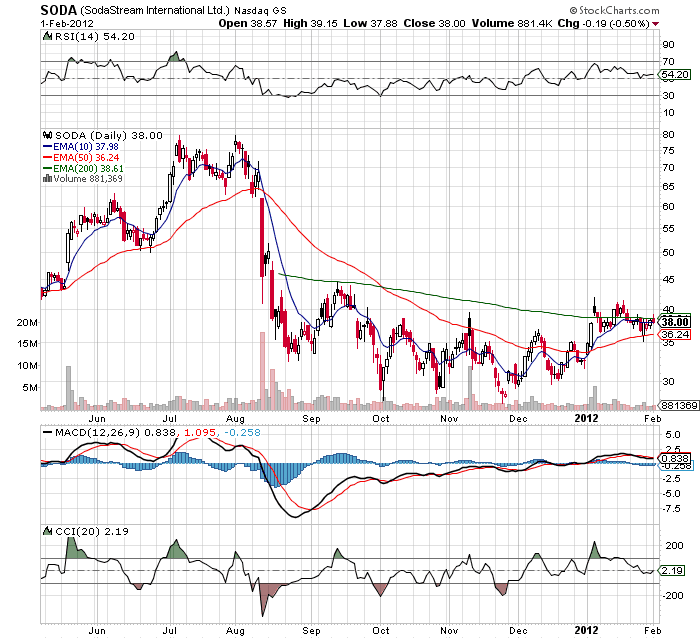 If the market had doubted the growth potential in Green Mountain, than it surely has done the same for SodaStream. With a typical beat, Soda would report earnings in the $.33 to $.37 range. It would not surprise us to see similar earnings to those reported in Q3 of $.42. Unless we're completely off base regarding the increased promotional spending. While the UPOD can be refreshing, it is having a very negative impact on the stock price of SodaStream. Not being overly promotional will ultimately benefit the company, but short term it has been frustrating. Maybe after this next report, analysts will finally clue in that management just wants to under promise. The chart below shows a stock that has been in consolidation for 6 months now. A rally above the 200ema could lead to an explosive move higher. The earnings from Green Mountain could be the impetus for such a move tomorrow. When that happens there just isn't a lot of resistance back to the highs around $80. Might not happen as quickly as the fall back in August, but I sure wouldn't discount it. Disclosure: Long SODA and APPL. Please review the disclaimer page for more details. The breakout took an extra day, but SODA is now exploding higher. Up 6% now. Looks like $45 provided some resistance last year, but other than that the chart appears wide open. Any thoughts from chart experts?